Seems like all of us have been staff picking it up lately -- maybe it's the terrible weather encouraging us to read under a mountain of blankets, or maybe it's just the abundance of great new books! Here's a slew of staff picks of our newest titles. Synopsis: With a gorgeous body, perfect hair and stylish clothes, you almost wouldn’t notice Terra’s facial birthmark. But the mark and her father control her life until a cute goth boy, a trip to China, and an art show change her life. Brilliant prose, cartographic imagery & well-crafted characters set this novel apart. Synopsis: A backwoods/Revolutionary war adventure told with gritty detail and interspersed with real historical segments. It is a fascinating and vivid portrait of frontier life in the late 1700’s. A fun way to learn some history. Synopsis: Everything changes for Ethan when the strange girl he’s dreamed about enrolls in his high school. Together they brave small-town prejudice, Dark forces, over-protective magical guardians, and a Carrie-style prom to break the curse on Lena’s family. An up-all-night story of star-crossed first romance! Synopsis: “A Lord of the Flies for the 21st century.” The novel explores the question “If there’s no meaning in the universe, what’s the point?” Upon this realization, 13 year old Pierre takes to living in a plum tree & practices doing nothing. His fellow classmates, unnerved by his newfound philosophy, try to get him out of the tree. The novel is at times creepy and always thought-provoking. Synopsis: In order to make the world “safe,” Incarceron, a vast thinking prison, was created to contain the criminal or mentally ill. Finn, an epileptic prisoner, finds a crystal key to communicate with a girl Outside – but can he escape before Incarceron thinks, and acts, for itself? This British import blends action, philosophy, and mystery. Synopsis: A year after Carly’s murder, her first love Neily and her cousin Audrey team up to exonerate Audrey’s dad and find the real killer. During their investigation they uncover unsettling truths about their community and Carly’s last months. Suspenseful and sad, this is a great novel for a stormy night. It looks like March will be coming in like a lion, so cuddle up with one of these great reads and a cozy blanket to stay warm inside and out. 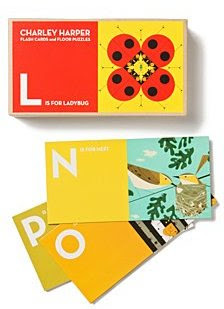 Anything involving Charley Harper is bound to be a staff favorite here at Curious George, and this set of alphabet flash cards is no exception! Staffer Natasha suggested the set should make it onto the blog this week, and since I'd planned to write about it anyway, I happily obliged. Harper's minimalist wildlife art is vividly reproduced on twenty-six 8" by 4" sturdy cards--and when you turn the cards over, they become pieces for two different floor puzzles featuring more of Harper's art! These flash cards are not only great for kids just learning the alphabet, but also great for art-loving adults to frame and hang as decoration. Like Porky says--th-th-th-th-that's all, folks! I've got a brand-new batch of reviews for you, from out of the mouths (the pens?) of babes. Thanks for sharing your thoughts with us -- keep writing and reviewing! Our... barrel... runneth over: many thanks to our co-conspirators in this monkey business. As Michelle mentioned in her post yesterday, we'd like to thank all of you who came in Sunday for our Alison Paul signing/Valentine's Day party! We had such a good time decorating V-Day burglar masks, seeing your "hardened criminal" faces in your mugshots, and coveting the mouth-watering sundaes you designed. We also need to extend great big grateful thank yous to Alison herself, her publishing team at Houghton Mifflin Harcourt, and our neighbors at Uno's Chicago Grill! 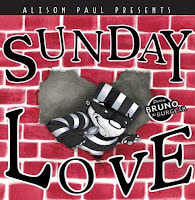 Alison not only wrote and illustrated the hilarious tale of a burglar and his true love, ice cream (bringing a new meaning to the phrase "sticky fingers"), but also dressed as a swanky burglar herself, brought a life-size Bruno, and read Sunday Love with all its sound effects. HMH people came out to lend Alison moral support, and we put them to work taking pictures. Uno donated ice cream and toppings, and their marketing coordinator hung out to serve it. It was awesome to have so many people outdoing themselves to make this event a huge success! Thank you! And I seem to have a fairy godmother or godfather at Penguin. After Incarceron last week, another review book mysteriously arrived for me on Monday. This one is The Sky is Everywhere by Jandy Nelson, which will be out in just a few weeks. I'm not at the store for the next couple of days, so I'll read them and report back. I'm looking forward to it. Thank you, nice Penguin person! Thank you everyone who came out for Alison Paul (and ice cream sundaes!) on Sunday! We sure had lots of fun and it looked, sounded, and smelled (mmm, the scent of hot fudge on sticky little fingers) like you guys did too! I saw some intimidating burglar masks and hilarious Polaroid mug shots - and best of all, some gorgeously delicious, heavily decorated ice cream sundaes. We'll have pictures up here and on our Facebook in a few days if you want to relive the fun, or if you sadly had to miss it. Last bit of news to look out for: we'll be announcing the guidelines and deadline for our annual art and writing contests in a few weeks, we hope you're working on your masterpieces! Okay, so the "blizzard" which had Boston in a panic yesterday was a complete flop. Almost everybody got a snow day anyway, but there was hardly any snow, and you know what that means -- no sledding, no snowmen, and no snowballs. As a California native, I was quite disappointed after patiently waiting for feet and feet of snow. However, three items of good news lifted my spirits! The title and cover of the new Hunger Games sequel (book #3) have been announced! Of course, now the wait until its middle of August pub date will seem even longer, but hooray for Mockingjay! I'm stoked to find out how Katniss and co. bring down the Capitol. Speaking of long waits, I haven't even been whining about how long I've been waiting for the new Neil Gaiman book. Aren't you proud? The incredible Charles Vess has illustrated Mr. G's poem "Instructions" (as in, instructions on how to survive a fairy tale); the picture book will be released in late April. That's only two-ish more months to go. I suppose I'll survive. Last but by no means least, our Sunday Love Valentine's Day party is THIS SUNDAY, the 14th, at 1 pm! Come in and warm your heart with Alison Paul's sweet love story, criminally fun crafts and activities, and a sundae courtesy of our friends at Uno. Now that's something worth waiting for! It's already started snowing outside, and Boston is expecting up to a foot of fluffy white--so I've got my eye on some fun items to keep me busy in case I'm snowed in tomorrow! This brand-new comic isn't like anything I've seen before, and I see a lot of comics. 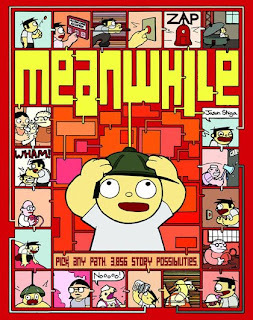 Meanwhile is a Choose-Your-Own-Adventure-style comic that begins innocently enough at an ice cream shop, but ends in any number of bizarre, funny, crazy situations based on what choices you make. Colored lines lead you from one panel to the next and from page to page via tabs, making a reading experience like no other! So far in my perusal, I've eaten chocolate ice cream, met a mad scientist, and read his thoughts using one of his inventions. I wonder what choices I have to make to reach the giant orange squid I spotted when I was flipping through? Aside from fun art and amazing layout, one of the small advantages to the system of tabs is that it makes it easy to turn straight to the page your choice lands you on--there's less chance of accidentally seeing things that might happen later on in your adventure, because there's no searching through for page numbers. The pages are glossy and sturdy enough to withstand the many readings that this book begs for, it's neither too big to carry around nor too small to properly see the art, and it even has an instruction page to help you sort out the unique reading method. I can't wait to snuggle into a blanket with some hot chocolate and try it out! We have a variety of wooden 3D puzzles here at the store, but this one is by far my favorite. 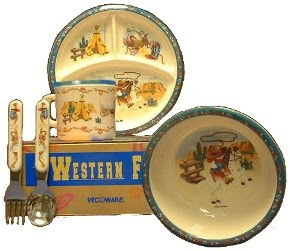 With 147 pieces to fit together, it's a surefire way to keep busy on a rainy or snowed-in day, and when you're finished, you've got a really cool and intricate conversation piece to hang up or display on the included stand. Best of all, the lightweight pieces are unpainted, making the puzzle more challenging and also giving the puzzler the opportunity to paint it to his or her own tastes (not to mention that a coat of paint after assembly will help the pieces hold together tightly). 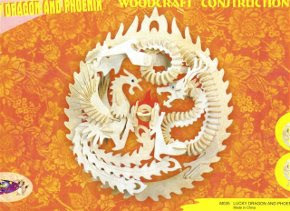 This puzzle measures 4"L x 12"W x 16"H, and comes with assembly instructions, as well as fun googly eyes to add a little personality to the dragon and phoenix! This is Rachel, signing off on a snowy day--catch you next time! We just got a slew of awesome new books in the chapter book room, some of which I've read already and some of which I can't wait to read. My ever-growing to-read list must be reshuffled (again) to prioritize new arrivals! A year after Carly’s murder, her first love Neily and her cousin Audrey team up to exonerate Audrey’s dad and find the real killer. During their investigation they learn unsettling truths about their community and Carly’s last months. Suspenseful and sad, this is a great novel for a stormy night. Here's my staff pick for Lisa McMann's Fade and its predecessor Wake; I'm waiting impatiently for Gone, due out tomorrow. 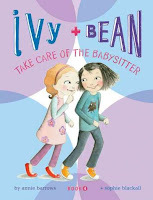 Janie’s ability to dreamwalk is a dark secret; her new friendship with Cabel provides much-needed comfort. When the police recruit the two for undercover missions, though, the stakes quickly become high. Unexpected dangers threaten Janie’s health, their blossoming romance, and even their lives. None of these are exactly fun-filled, light-hearted romps, but if you can brave difficult topics for the sake of an amazing story, come in and ask me about these books. I'll talk your ear off about their wicked geniusiness. Whew! I hope that's enough reading to get you through these yucky winter days when curling up with a good book and hot chocolate sounds like the best idea ever. Now I just need to pick one to curl up with myself! 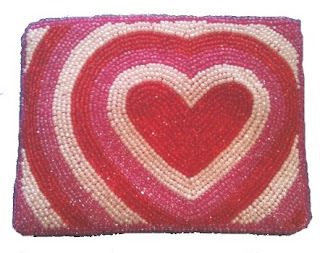 I never really got over my childhood love of beaded things, so these beaded purses are right up my alley! We've got them in three eye-catching designs of pinks and reds that just scream Valentine cheer. My personal favorite is the psychadelic heart purse pictured to the right. The great thing about these is that they're sturdy, and larger than your average coin purse--they could probably even double as a tiny clutch, if you don't plan to carry much stuff on your V-Day excursion this year. The beading is tight, the inside is lined with satiny pink, and they have a pleasantly solid weight to them that I rather like. Just perfect for a little goofy-love-eyes-inducing surprise! What better way to wake up someone you love than with breakfast (or brunch...or lunch!) that tells them you care? 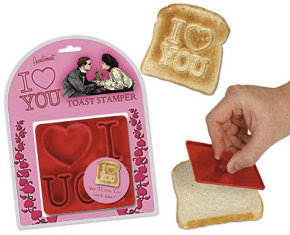 Just press this toast stamper into a piece of bread, stick it in the toaster, and when it comes out, voila! A message etched by the flames of your love. (Not really, unless you have a very special toaster, but you could tell people it was etched with the flames of your love.) A sweet, silly, simple way to brighten somebody's V-Day! Love always has its bumps and bruises, but these band-aids are the perfect TLC. 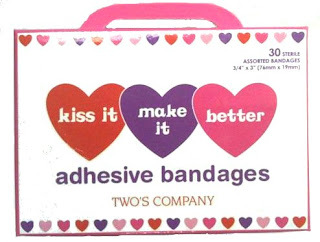 Use them to kiss and make up, or cover that burn you got trying to bake sweets for your sweetheart, or as a little reminder to your loved ones that you care. 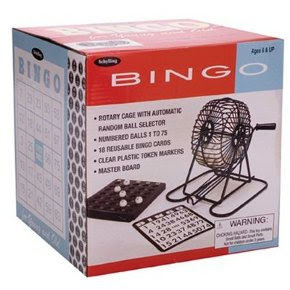 However you use them, you've got 30 tries in one little box to get it right! 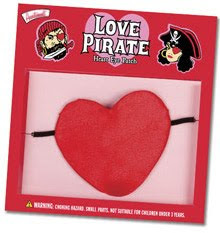 Do some swashbuckling this V-Day with this awesome accessory! A flexible, bendable plastic patch covered over in satiny red fabric, it's the perfect aid in stealing hearts and looting booty (you know...treasure!). The comfy elastic band will keep your heart in the right place, even through the stormiest seas, and if there are some unexpected kisses, well...blame it on the lack of depth perception. My staff pick of this book made it into an earlier blog post, but I can't make a list of unique choices for this holiday without including it. 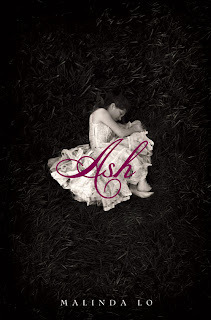 In a lesbian retelling of Cinderella, Ash must bear the death of her parents and the cruelty of her status-hungry stepmother, fulfill her bargain with a fairy godmother like none you've ever seen before, and find a way to follow her heart where it leads her--straight to Kaisa, the dashing and kind King's Huntress. 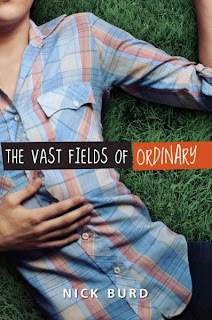 This is my favorite lesbian YA novel since Annie On My Mind, and that's saying something. In the not-too-far future, the internet has evolved into the Feednet, a constant flow of information and advertisements through a chip implanted directly into the brain. Privacy has become a thing of the past; conglomerates can mine thoughts for marketing data, the government can subpoena memories, and people can speak "telepathically" with one another via M-chat. 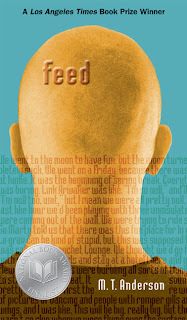 Titus has never considered a world without the Feed until he meets Violet during a trip to the moon. Violet is different--Violet wants to fight the Feed. It's sometimes hard to find good sci-fi for young adults, and not only is Feed an awesome read, but it's a refreshingly unique futuristic romance. I haven't had the pleasure of reading this collection yet, but what better way spend a relaxing Valentine's afternoon than reading love stories? I can't wait to check it out! 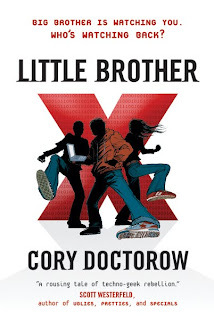 Marcus is wise in the ways of the networked world, and has no problem finding ways to hack his school's intrusive security system so that he and his friends can skip. They get more than they bargained for, though, when they're caught up in the aftermath of a terrorist attack; Marcus is apprehended by the Department of Homeland Security, held captive and interrogated in a secret prison. When he's finally released, Marcus comes home to find San Francisco devolved into a police state. When nobody believes his story and conditions worsening by the day, Marcus has no other option but to take down the DHS himself--with the aid of the fourth girl he's ever kissed, Ange. An excellent geek-chic story with a techno-romance to match! Yet another book on my V-Day to-read list, this one was recommended to me by a librarian friend, and was the winner of this year's ALA Stonewall Book Awards in the Children's and YA category. Looks like Valentine's is going to be all about reading for me this year! 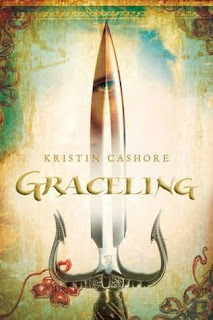 We here at the George are big fans of Graceling, and we've blogged about it before, so I'll try to contain my fonts of praise. I can't round up great romances, though, without including Katsa and Po. 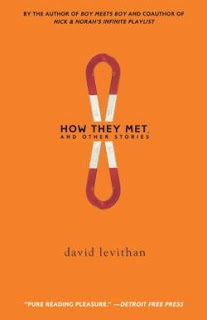 Their romance is one of the funniest and most appealing I've read in some time, full of obliviousness, confusion, angst and stubbornness. If you're tired of the same old love-at-first-sight storyline, then this is the book for you. Whew, that's a lot of love! I'll catch you soon for a return to my regularly scheduled What Rachel Wants in the next week or so.